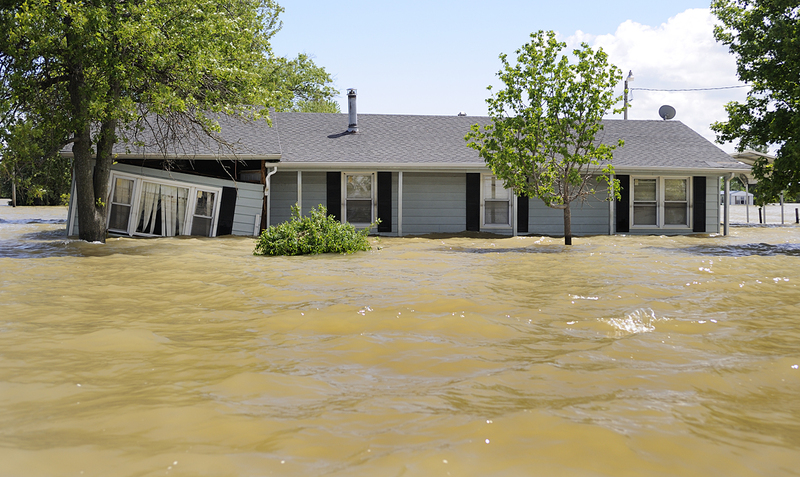 After my recent trip to the flooded area of southeast Missouri known as the bootheel, I came home to meet a previous commitment for the days since then. I am just now resurfacing to catch up with the news and see the effects of flooding on the lower Mississippi. Another trip is in the planning stage – but, for now, I want to share some of the stories of the people of the flooded land of the Missouri bootheel. “Mr. George – I’ve brought you company!” announces my friend, Silvey, as we walk into the school bus barn. “Well, get on in here!” a voice calls from beneath a school bus. A tall, smiling man slides out, wipes the grease from his hands and welcomes me with a deep throaty chuckle. 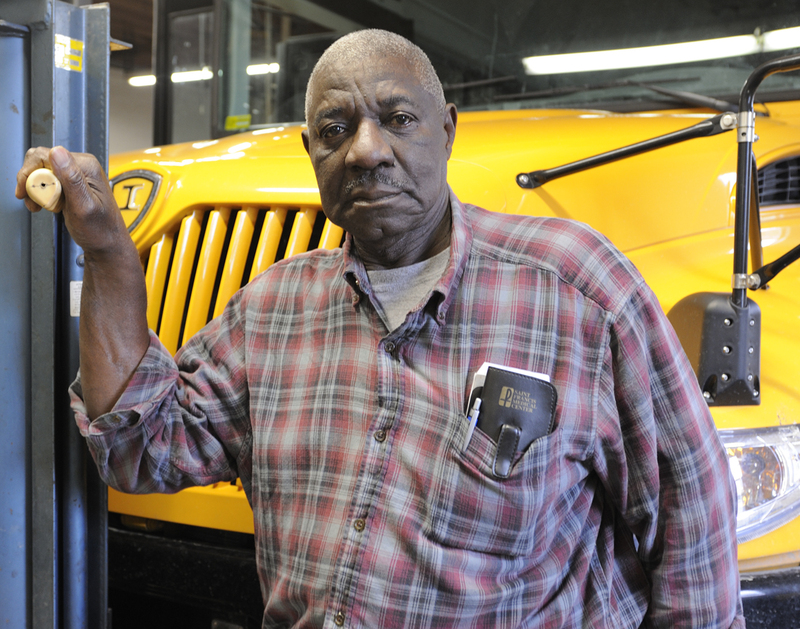 Probably everyone in East Prairie, Missouri, knows George Williams – he has been driving the local school bus since 1962. His warm handshake and direct gaze give me an immediate image of several generations of students holding both respect and affection for this gentle, strong man. I’m piecing together the history of Pinhook, Missouri, and by the time it goes into the book, I’ll have a more complete picture. So far, I am told the community was created as a result of the sharecropper’s revolt of 1939. In recognition of and reparation for the bad treatment received, land was made available to the Christian Liberty Association. African Americans, who were otherwise prohibited from owning land at that time, could obtain 40 acre plots through that organization. Farms and homesteads were created and the community of Pinhook was born. Pinhook thrived for a time – during the 1950s and 60s, it was home to as many as 250 people. In the years since then, however, things got tougher and much of the land was sold off as families struggled to support themselves. It’s always been a tight-knit community where people take care of each other. “Most everybody’s family in some way or ‘nother,” he says, smiling again. I know as I leave Mr. George that I will likely see his flooded house before he will. I am scheduled to tour the area by air and by boat later today. My words of empathy and comfort seem to me inadequate for his loss, but his warm smile is back as we say goodbye and I feel his resilience and goodness. My pilot knows which house belongs to Mr. George and points it out, half-submerged and surrounded by a vast sea of murky water. Even from here, I can tell it sits at the end of a street of well-tended homes. The closer and more heart-wrenching view of Pinhook, however, is from the boat. 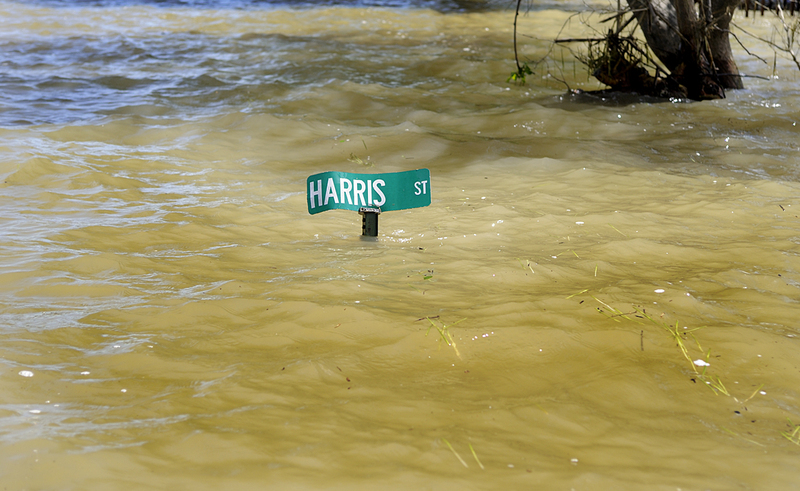 A street sign barely extends above the water. Houses are torn apart by the powerful current and waves created by the wind. I know that under the carport Mr. George’s “old but good” 1979 Dodge Diplomat lies submerged; he couldn’t drive it out because the water came up quicker than expected. Water rushes through Mr. George’s house and an entire section of wall bobs loosely with the waves. Vertical blinds wobble with the current rushing through the shattered picture window. All the drapes and blinds are drawn shut and I imagine the final moments of closing the house up, locking the door and hoping against hope. The silence feels hollow and dead, as if the water has washed away even the echoes of those who lived here. There is not even a bird call – nothing but the putter of our boat motor as we ride the choppy water a dozen feet above the street. Pinhook Day would have been this weekend. Nearly everyone who ever lived at Pinhook came home over Memorial Day weekend. Every house would have been bursting with people gathered for noisy reunion picnics filled with laughter, conversation, music and good food. To all of you who would have been there today, my heart goes out to you. 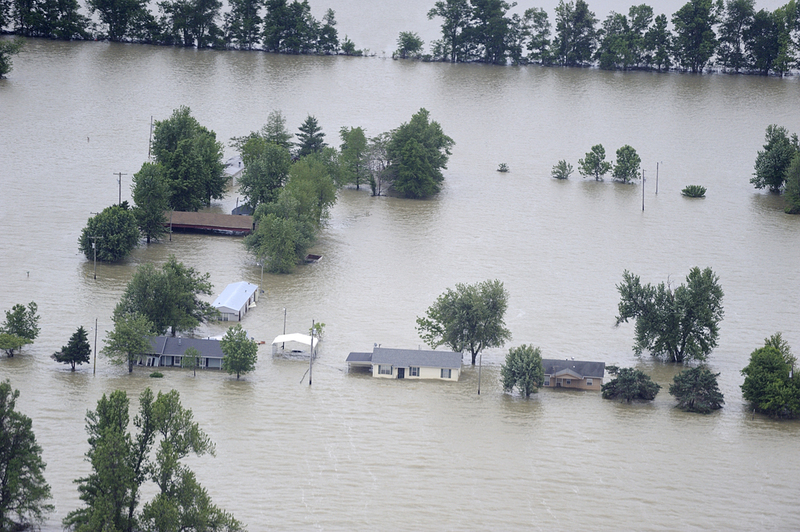 This entry was posted in 2011 Mississippi River Flooding, MO - East Prairie, MO - Pinhook and tagged Bootheel of Missouri, East Prairie Missouri, Flooding 2011, Mississippi River Flood of 2011, Pinhook Missouri. Bookmark the permalink. Gayle – What a story you have packed into a few paragraphs, and the video and pictures help us to feel the experience with you. I so appreciate your telling the stories of the people you meet, one by one…as that is what changes us. I remember George Williams. My family operated a grocery store on Pinhook in the 1960s until very early 1970s.